Dish Restaurant is the A la Carte restaurant within the luxurious Le Franschhoek Hotel and Spa on the outskirts of Franschhoek (the gourmet capital of South Africa). Dish Restaurant offers diners an opportunity to indulge in a scrumptious a la carte menu. With a seducing menu comprising of delectable dishes from locally sourced produce, diners are truly spoiled for choice at Dish. The menu is seasonal and under direction of Executive Chef, Scott Shepherd. 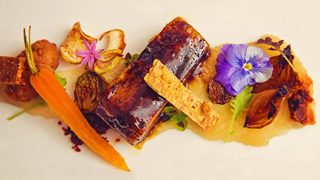 Dish proves to be a culinary experience in the heart of the gourmet capital, Franschhoek. For Wine Enthusiasts – Dish presents various Wine and Food pairing evenings throughout the year in conjunction with local, South African wine estates. With picturesque vineyards a stone’s throw away, the sophisticated charm of Le Franschhoek Hotel and Spa is elegantly portrayed in Dish Restaurant. Wedding and special functions are available throughout the year at Dish Restaurant.